It was very fitting that the first day of the International Cannabis Business Conference in Berlin focused heavily on medical cannabis research as the German medicinal marijuana system just recently improved, paving the way for thousands of patients to utilize cannabis to improve their lives. It just made sense that the first day of the Berlin ICBC would be sponsored by Leafly, an international company that has done so much to educate and inform patients about various strains and dispensaries. Suffice to say, the after-party did not disappoint as hip hop MC legend KRS-One took the stage, along with the reggae-dancehall-hip phenom Rocker T.
The ICBC always strives to provide the best, up-to-date information, and the Berlin event was no different, featuring two of the top German medical marijuana doctors, Dr. Eva Milz and Dr. Franjo Grotenhermen, along with other preeminent researchers, extractors and consultants from around the world. In addition to the newest developments in science and business, ICBC events provide excellent opportunities for cannabis advocates and entrepreneurs to network and the Leafly-sponsored after-party definitely didn’t disappoint. Rocker T, who has performed at many ICBC events and at concert venues and parties, around the world, brought his positive message, getting the crowd hyped. KRS-One, for those that may now know, about this music icon, brings a socially conscious message to his music, peeling back the veil on government corruption and hypocrisy, to his prepared music, as well as his freestyle performances. 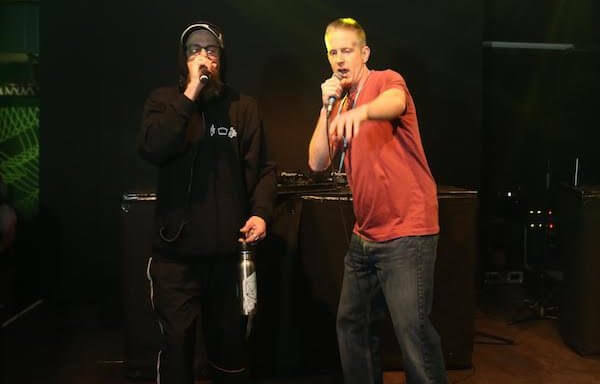 Inspired by KRS-One, and urged on by Rocker T, ICBC founder Alex Rogers, known as Jahbhang to those familiar with his musical background, even joined in the freestyle fun. 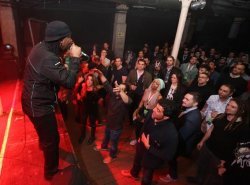 The Berlin ICBC has been a historic conference and such an epic event needs a great after-party and Leafly made sure that the party didn’t disappoint. Leafly, already known around the world as a leading resource for the cannabis community, will be implementing a German-specific site, Leafly.de in the near future, so Leafly has been the perfect partner for Europe’s first business-to-business cannabis industry conference. Featured photos credit: Matt Emrich.